Any business that has to deal directly with clients such as the retail or hospitality sectors should recognise the importance of creating a great first impression. It isn’t solely about the way you meet and greet your customers or clients, but it’s about setting high standards. In other words it’s how the whole package of your business comes across and that includes how clean your carpets are. For example, you could have a great business ethos coupled with super-efficient customer service, but if your office/hotel/retail space carpets are stained or dirty and looking decidedly more shabby than chic, then the customer might be only too quick to make an unfavourable judgement. For this reason, regular carpet cleaning maintenance should become part and parcel of your business. 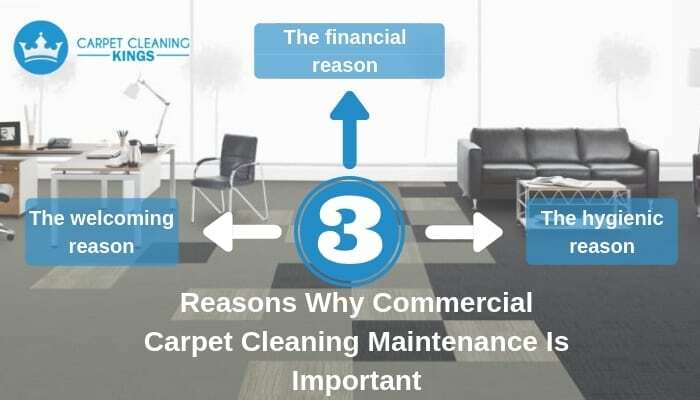 If this hasn’t convinced you, there are 3 other equally important reasons why you should carry out regular carpet maintenance. Let’s take a look. When having to replace carpeting it’s a considerable investment for any business, especially in the early days. As a result any company would no doubt welcome the chance to invest their money in other key areas such as attracting new clients, developing new products, or stream-lining existing services. The good news is that by having your carpet regularly and professionally maintained it allows you to do just that. You see, it’s been proven that if a carpet is regularly and professionally maintained its shelf life can be extended by as many as 10 years. That’s 10 years of money you don’t have to invest in replacing existing carpets but instead can use it to grow your business. In anyone’s book, that’s a win/win situation! From another financial stand point, hiring a professional carpet cleaning service doesn’t come cheap, especially if they have to carry out a full deep clean. Instead by having a regular maintenance program in place, the cleaning company will instead carry out a series of intermittent light cleans. Aside from keeping your carpet looking tip top, you’re also going to save money in return. Let’s say you’re an advertising business waiting for an important potential client to arrive at your office and if all goes well you could strike up a lucrative deal that will keep your company in business for years to come. Alternatively, you’re a hotel trying to persuade a bride and groom to hold their lavish wedding ceremony right here at your venue. Whatever the scenario it’s important to create an environment whereby they immediately feel relaxed and welcomed. A pristine clean carpet does exactly this. It may seem unimportant, but when people feel relaxed in another’s company, they’re more perceptive and open to putting their trust in the recipient. If you’ve ever tried to plump up a cushion or pillow when the sun is streaming through the window you’ll undoubtedly see a cloud of tiny particles. These dust particles move through the air until they settle once more on another unsuspecting item. The same thing can happen to your carpet. When disturbed, thousands of tiny dust and dirt particles that have previously settled will rise up and move through the air. In particularly bad cases it can even affect air quality. By having your carpet cleaned regularly the dust particles are kept to a minimum thus making for better, cleaner air. At Carpet Cleaning Kings, we’ve been in the industry for many years and we specialise in all aspects of residential, industrial and commercial carpet cleaning including regular maintenance programs. Why not give us a call on 1300 7000 75 today to see just how we can help you.